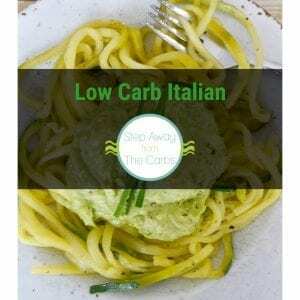 This low carb spaghetti and meatballs entree is super filling, super tasty, and super low in carbohydrates! If you’re craving spaghetti and meatballs you just have to try this recipe! I’ve substituted regular noodles for Angel Hair Miracle Noodles – and they work so well for this dish! The ratio of meatballs to sauce is probably a little higher than you might be used to, as this keeps the carb count down. But for under 8g net carbs you’re getting a huge portion of 10 meatballs! And if not everyone in your family is convinced by the zero carb noodles, you could always cook regular spaghetti for them, but everyone can have the same sauce. To make the meatballs, combine ground pork, ground beef, eggs, Parmesan, Italian seasoning, salt and black pepper in a large bowl. Mix well, then form small meatballs – this recipe makes about 40! If you’re preparing the meatballs in advance, place them on a plate or tray lined with baking parchment, cover, and store in the fridge until required. When ready to cook the meatballs, place them on a baking tray lined with a silicone mat, baking parchment, or foil. Place in a preheated oven for 15-20 minutes or until the meatballs are cooked through. Meanwhile, add tomato sauce, onion powder, Italian seasoning to a deep saucepan and add salt and black pepper to taste. Bring to the boil, then keep warm while the meatballs cook. Also prepare the noodles at this time according to the pack instructions. For the Miracle Noodle brand this means rinsing well under cold water, then leaving for five minute in a bowl of boiling water. Add the cooked meatballs to the sauce and turn to coat. Drain the noodles, serve, and then top them with the meatballs and sauce. Garnish with a little extra grated cheese if you like. 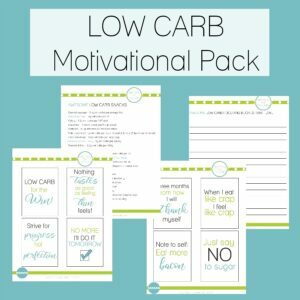 Now everyone can have low carb spaghetti meatballs! In a large bowl, add together all the meatball ingredients and mix well. Form the mixture into small balls (about 40), and place on a baking tray lined with a silicone mat or foil. Bake the meatballs for 15-20 minutes or until fully cooked. Add the sauce ingredients to a large pan, bring to the boil, then keep warm. Prepare the noodles as per the pack instructions (draining and leaving them in a bowl of boiling water). Drain the noodles, serve, and add the meatballs and sauce. Garnish with extra cheese if desired. 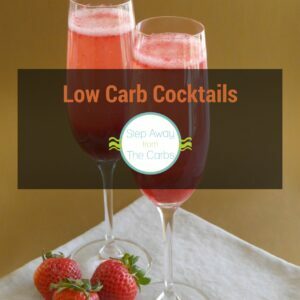 Delicious – you would never know they were low carb! Spaghetti and meatballs is such an Italian American classic. I like using the angel hair shirataki noodles, too. Thanks for this recipe! I am a meatballs kind of girl! Just made some yesterday, actually. I noticed you used parmesan in your mix – that sounds delicious and will have to be made asap! What a classic dish! Miracle Noodles are so amazing. I love them! Me too – they’re a life changer! Yum! I need to give shirataki noodles another try. This looks good! I actually make my meatballs a different way. But I’d love to try this! I’ve never tried the miracle noodles. Honestly, I am a bit worried I might have an allergy. I have had the Miracle Noodles and thought they were great – I made a Ramen-type soup with them. Your meatballs look great, too! Ooooh a Miracle Noodle Ramen sounds amazing? If you have a link please leave it here!